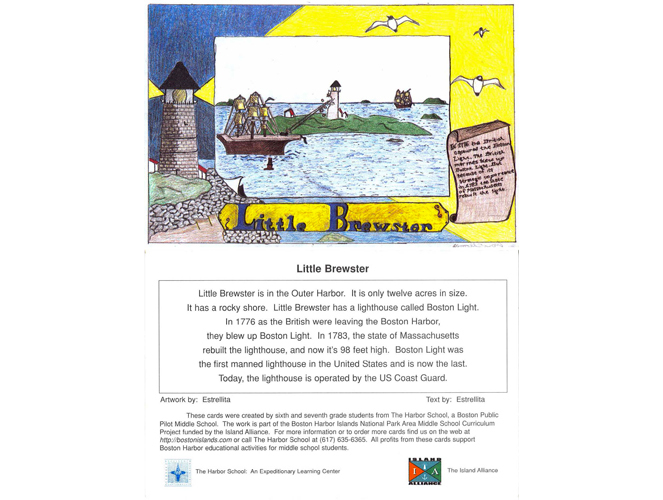 These note cards were created by 6th and 7th grade students at the Harbor School in Boston, Massachusetts, as part of a learning expedition on Boston’s Harbor Islands. 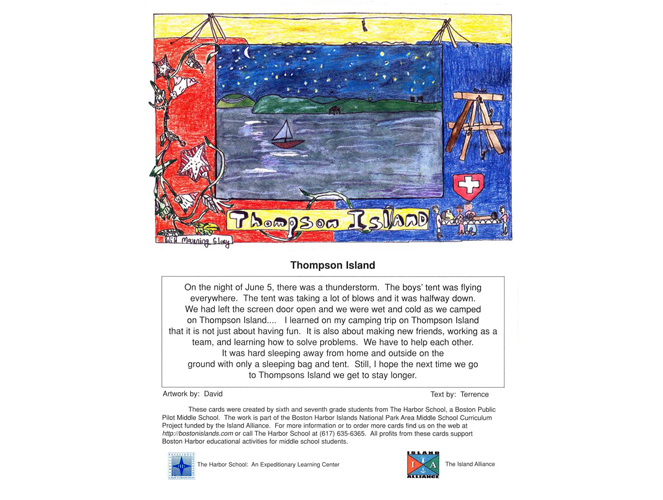 The purpose of the expedition was to introduce students to the history and beauty of the Harbor Islands – an ecological resource and little-known national park right near the school. 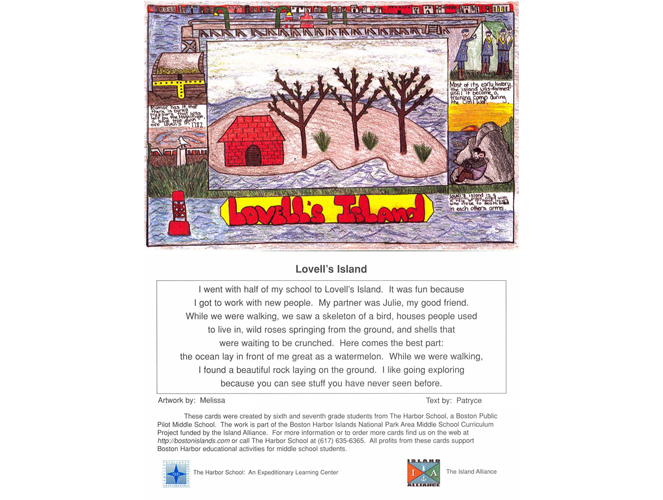 Students conducted research about the Harbor Islands through fieldwork, during which students traveled to the islands. Students also learned about the islands through work with local experts and examination of historical documents. Through their research, students worked the Island Alliance, whose mission it is to preserve and protect the islands as a National Park. On the front of each card is a detailed and intricate colored pencil drawing of one of the islands. 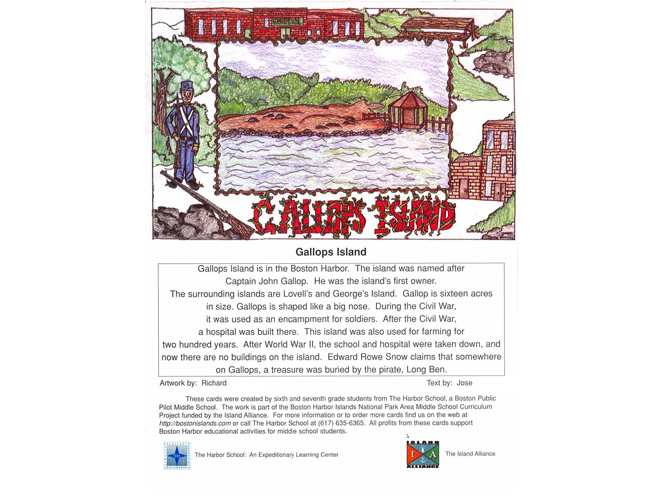 Each illustration contains a current view of the island in the center as well as historical/cultural information on the border. 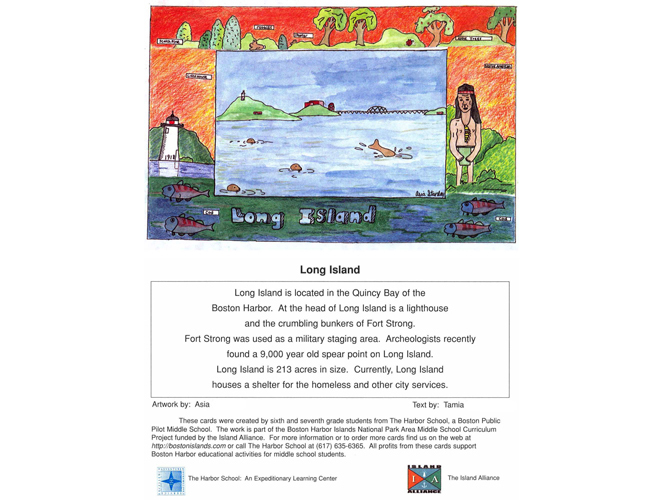 These illustrations are accompanied by student-written information about the depicted island. Student writing and illustrations went through multiple drafts and students critiqued each other’s work. Each card represents a partnership: one student did the illustration and another student worked on the writing. Through their work in this expedition, students became spokespeople for the Island Alliance and became committed to restoration of the islands. It was a powerful experience for these students to become featured speakers at fundraisers. These cards were sold around the Boston area and proceeds went to support middle school education efforts by the Island Alliance. Framed originals of the artwork, which were much larger than the cards, were hung in the school. As one of the first products to be created at the Harbor School, these cards helped establish a culture in the school of craftsmanship and valuing of high quality work. Quality of craftsmanship is excellent in the illustrations and the writing. 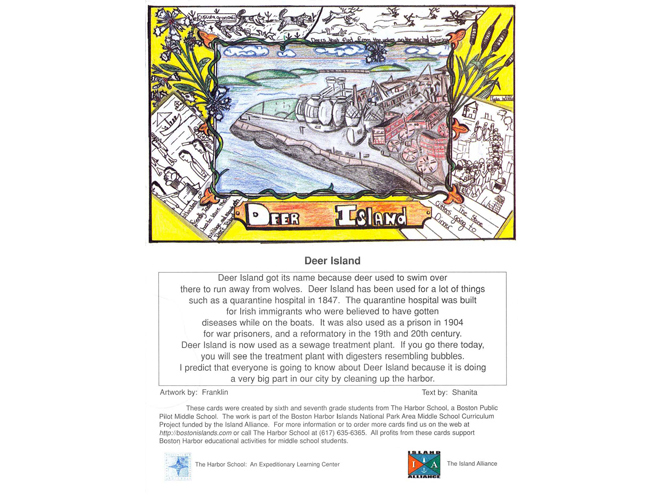 Notice the detailed work shown through illustration in the Deer Island card. Exemplifies using local natural resources as the source of a Learning expedition. Highlights the power of local fieldwork and working with local experts. Demonstrates an expedition that authentically enticed students to become activists on behalf of a natural resource. Exemplifies an interdisciplinary project – one that combined social studies, art and language arts. A product that through the range of cards within the set shows the learning of the whole class – no one card tells the whole story it by itself. I can produce clear and coherent writing that is appropriate to task, purpose, and audience. With support from peers and adults, I can use a writing process to produce clear and coherent writing. I can use correct grammar and usage when writing or speaking. I can use correct capitalization, punctuation, and spelling to send a clear message to my reader.